Tham Pla caves. are about 12 KM south of Mae Sai are a visit if you are in the area. 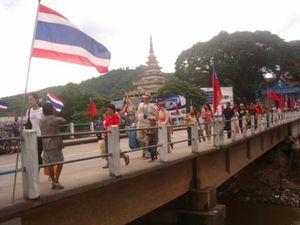 It is a 2km walk from the main road get off buses at Ban Tham Pla. Unfortunately, the park has been allowed to become very run down but there are still interesting things to see. If you haven't got a torch (flashlight), needed as as there is no artificial lighting in the caves, you can buy one just before entering the cave to the right of thee temple. Watch out for the monkeys which sometimes steal bags from you. Free entry, Aug 2014. There are other caves nearby signposted on the road to the Tham Pla caves. Free. Wat Phra That Wai Dao, (before Immigration, turn left and go through covered bazaar). Built on a small hill up a steep staircase, overlooking Mae Sai and Tachileik, this temple and its stupa are unremarkable, but there are a few interesting monuments around it. Aug 2014 it is under major repair Next to the stupa is a small Burmese temple that gives a nice taste of what awaits on the other side. Towards the river is a multistoried monument to King Naresuan, a Lanna king famous for beating back several Burmese invasions and dispatching the Burmese crown prince in a duel, and just in case the message of this isn't clear enough, there's also a giant scorpion statue brandishing its claws towards Tachileik. Free. Maesai Complex Hotel, 284 Moo 7 (About 200m to the east of the border crossing), ☎ 053-731871, 087-3013936. Somewhat basic but clean and adequate and with an outside bar across the street (there are few places open during the wet off season (about April through September). The English speaking son of the proprietors says they are planning to turn this into a backpacker hostel with beds from 200 THB with no seasonal variation. It also has an open air bar in the evenings. From 300THB.